Mithridatic Wars - A series of three wars fought between Rome and King Mithridates of the Kingdom of Pontus in eastern Asia Minor. As Rome expanded eastward in the 1st century B.C. it came into conflict with Mithridates who was working on expanding his own kingdom. 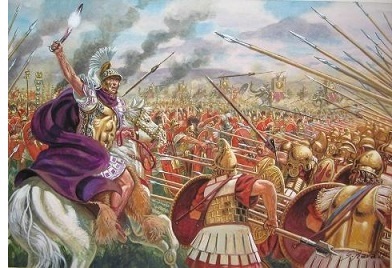 The first war was fought between 88 and 84 B.C., the second between 83 and 81 B.C. and the final between 75 and 63 B.C.. Sulla, a de facto dictator, commanded the Roman army in the first war and Pompey the Great came to the rescue in the third war. Pontus was absorbed into the Republic.